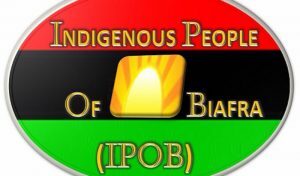 The Indigenous People of Biafra(IPOB) has announced May 30th as the date for this year’s sit-at-home exercise. Its media and publicity secretary, Emma Powerful announced through a press statement. The exercise has become an annual event, which the group said is used to honour Igbo indigenes who lost their lives in the three-year-long civil war which took place between 1967 and 1970. IPOB said this year’s event would be special as it has included states in the middle belt, which are being ravaged by Fulani herdsmen as part of the exercise. Powerful said another unique feature of this year’s exercise is that unlike other years when members are advised to stay at home, this year’s will feature solemn church service from the night of 29th May all through to 30th May. This it said would be in honour and in remembrance of those killed during the civil war, those killed by security forces during IPOB rallies and those killed by Fulani cattle herders in the middle-belt area of Nigeria. Part of the press statement released to Nigerian Tribune correspondent by the group read, “We consider it imperative to use this opportunity to announce the sit at home order throughout Biafraland and Nigeria in remembrance of our fallen heroes and heroines. “This year, we shall also remember all victims of Fulani herdsmen attacks, Boko Haram violence and those that died at the hands of Nigerian security agencies over the years that nobody remembers. The group further stated that, “This year’s remembrance will be special because it will present a unique moment of shared pains and misery for all the families that lost their loved ones to war, hunger, disease and terrorism. “We remember those that sacrificed their lives to defend the defenseless and those that lost their lives because there was no one to defend them. “There will be no human, vehicular or animal movement across Biafraland on the 30th May 2018. Biafraland will be on total lockdown. Middle Belt and Yorubaland brethren are advised to join this historic sit at home to honour the memory of all that died unjustly in Nigeria. “Churches, mosques, synagogues and temples are encouraged to open their places of worship on the midnight of the 29th of May for special midnight prayers in remembrance of all that died as a result of violence. A special vigil will be held at the homes of select Biafran heroes. It called on its members in the Diaspora to ensure full rally on the streets of their respective countries with written petitions which would be submitted to the nearest United Nations offices and embassies of foreign missions in those countries.